Give a gift that keeps on giving. 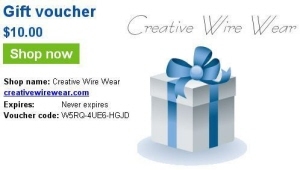 Gift certificates are a great way to give a gift for the hard-to-buy for.....be it a wife, girlfriend or special someone - a gift certificate is a great way to show your appreciation. Perfect for Birthdays, Anniversaries, Christmas, Graduation or any special occasion. It's really simple. Just purchase the certificate like any other product in our store. 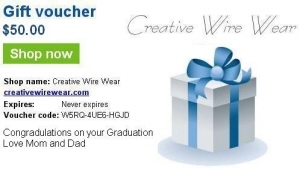 Within 24-48 hours you will receive an email from us containing your certificate suitable to be printed and placed into a gift envelope. 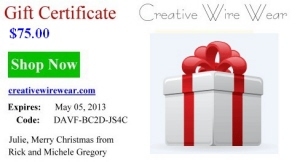 The certificate will have a special Gift Certificate ID, and instructions on how to use it. NO cash refund 6-months after purchase of a gift certificate. 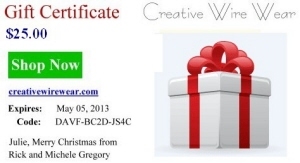 To redeem the certificate online, the Gift Certificate ID must be entered at Check Out. The amount of the certificate is deducted from the total purchase price. Note: The images shown here are a close representation of the actual certificate. Images can be changed for your special occasion, please send us an email of what you're looking for and we will do our best.